A new $42-million investment has been built on the campus of Bowling Green State University. The Wolfe Center for the Arts has been in progress since 2004 and finally opened to the public in the fall of 2011. Frederic and Mary Wolfe of Perrysburg, Ohio, have been pushing for a new arts building to open to help further the education of students at Bowling Green State University. Bowling Green State University opened the doors to the new Wolfe Center for the Arts Building. Photo by Meghan Coburn. Ron Shields, chair of the theatre and film department is very excited about the center. “This truly is one of a kind. The work that has been done is unbelievable,” said Shields. One of the best and most renowned architectural designers SNØHETTA, from Oslo, Norway put together a unique design for this project. The Wolfe Center has a distinct look. 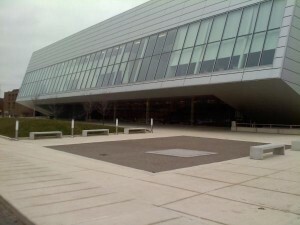 Angled walls, glassy incline in the entrance and a vertical “fly tower” that resembles the collaborative arts on campus, are just a few unique designs to the center. Callie Watkins, sophomore and communications major, attends two classes in the new center. “I am new to Bowling Green State University and the fact that I attend two classes in this new gorgeous building makes going to class fun,” said Watkins. The Wolfe Center not only has offices and classrooms, it also has two theaters. The Eva Marie Saint Theatre holds approximately 120 people around the center stage and up onto the second level. 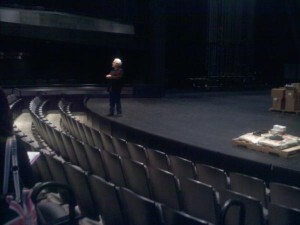 In addition, the Thomas and Kathleen Donnell Theatre seats 400 people. “The Donnell Theatre puts me at a loss for words. The most remarkable feature is the risers. I have never heard of anything like that before,” added Watkins. State-of-the-art lighting, sound technologies and equipment can be found in the Donnell Theatre. The Thomas B. and Kathleen M. Donnell Theatre with Ron Shields, chair of theater and film department. Photo by Meghan Coburn. The Wolfe Center for the Arts is the first completed project by SNØHETTA The process may have been long and crucial but the outcome is unbelievable. Ryan Miller, BGSU’s project manager, was very pleased with the ending results. 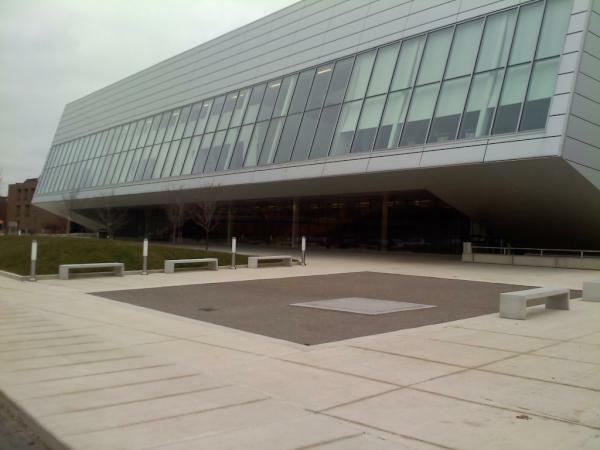 “For BGSU to have this building on its campus is a blessing. The Wolfe Center is a monumental design and being a part of this process makes it more amazing,” said Miller. “Arabian Nights” will be the first play held in the Eva Marie Saint Theatre starting on Thursday, Feb. 16-26. This entry was posted on Wednesday, February 1st, 2012 at 10:44 pm	and is filed under Wolfe Center. You can follow any responses to this entry through the RSS 2.0 feed. Both comments and pings are currently closed.